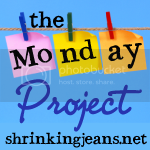 Okay, this is my first Monday Project, so I’m going to start at the beginning of the projects and try to catch up (though this might take a few weeks!!). The first project was Project “Me”  a chance to look at what’s worked/not worked in the past, goals for moving forward and reflecting on both of these. I’m not sure how much to write here, but I have been thinking about these questions throughout the week. One of my big issues has always been exercise. I *know* that my weight-loss and goals of getting healthier only work well when I work exercise into my life. In fact, they go best when I have some form of weight or resistance training. Fitting into my schedule has always been the problem. Last year I tried getting up before work to do a 20-30 minute workout  this entailed setting the alarm for 5AM and getting up at the first alarm (no snoozing). I managed to do this for nearly 6 months…but it was a fight every.single.time. I figured it would get easier over time, but it was a constant fight. It also meant that I had to start getting to bed no later than 9PM  in bed, lights out ideally by 9:30, no later than 10PM. I ended up basically quitting exercise as of October/November last year. I just couldn’t face 5AM. So, I’ve gone back to exercising in the evenings, after work. When I get home, I change into my exercise clothes, and head downstairs. One of the reasons I got away from evening exercise was that my husband now works later. When he got home relatively early, I would go exercise when I got home, he would start cooking dinner when he got home, and usually dinner would be ready about the time I was done showering. Now with him getting home later, I feel like I need to get dinner going, so we’re not eating at 7 or 8 PM. However, he’s making an effort to get home a little earlier, and he wants to support my efforts to exercise, so we’re making it work. And its a lot easier than getting up early. Another thing about exercise  I’m a biker, and I do much better biking when I have a clear goal for that season’s biking. I push harder when I have a goal I’m working toward. SO, my husband and I have decided to train for a half-century ride this year. It’s a little scary, since we’ve only ever done a 30-mile ride twice (maybe 3-times), and when we did, it took everything out of us for that weekend. On the other hand, it means that we’re going to push this biking season; and we’re setting up a training schedule, and with both of us on board, we’ll be pushing each other (prodding when necessary!). Eating-wise…that’s a bit harder. I’m still figuring out what works there, though I seem to do best when I’m not on a formal plan  instead, I just need to be constantly aware of what I’m eating and why. I’m a little embarrassed to say that in the past several years, the best I did was when I was following Dr. Phil’s plan…I may need to resurrect my copy of that book and go through it again.